Today's court proceedings as regards to the endless case between the abducted leader of the Indigenous People of Biafra (IPOB), Mazi Nnamdi Kanu, Benjamin Mmadubugwu, David Nwawuisi, Chidiebere Onwudiwe and the newly added Bright Chimezie held in a dramatic style. Upon the arrival of the trial Judge, Justice Binta Nyako, followed by the introduction of the case and both Counsels to the plaintiff (Nigerian govt) and the defendants (Nnamdi Kanu & Ors) as the presence of the defendants were also acknowledged except Mazi Nnamdi Kanu (1st Defendant) who is in the custody of Nigerian Army who captured him when they raid his home in Abia State. As at 10. 21 AM when the case file was called up, Nnamdi Kanu was not sighted because Nigeria Army has not released from their coustody. After the introduction of the both Counsels, Bar. Shaibu Labaran, Counsel to Nigeria government after introducing another motion for an amended charges, told the Court that the main reason for today's court sitting was for the court to revoke the bail grant by asking the court why the sureties cannot forfeit their bail bonds as they have failed to provide the the accused whom they suretied. Mr Labaran therefore prayed the Court to skip the first defendant out to enable the trial of the other defendants to proceed. Mr Labaran continued further by letting the court to know how the Counsel representing Sen. Enyinnaya Abaribe handed him notice asking for adjournment. He further stated that the first defendant, Mazi Nnamdi Kanu who was granted bail but was nowhere to be found is giving some strings to the trial. 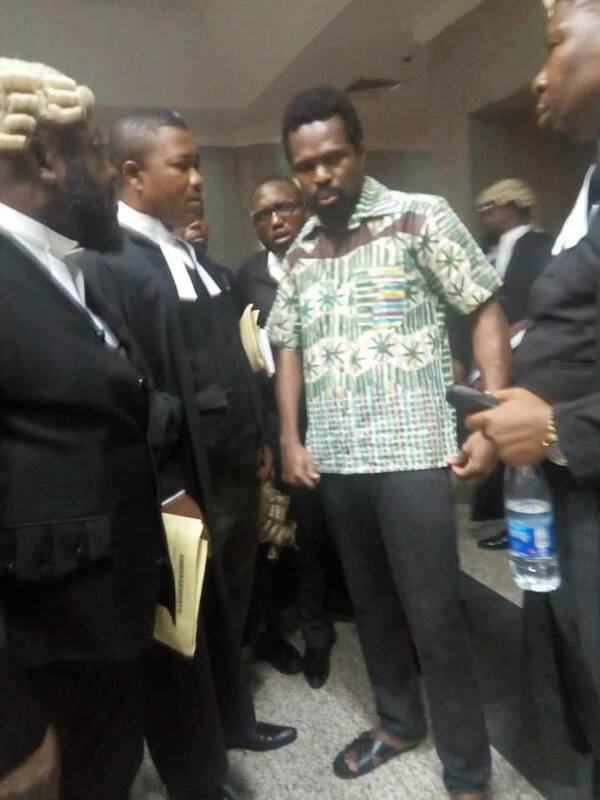 In response to that, Bar Ifeanyi Ejiofor stood and told the court that the whereabout of his client (Mazi Nnamdi Kanu) is not yet known since Nigerian Army invaded his home sometimes in September 2017. He further stressed that before in his prayers to the court that until his client is provided or released by Nigerian Army, the International Community will be taking Nigerian Judiciary for granted. While making progress, the Counsel representing Mr Tochukwu Uchendu on his own side, made it known to the court that his client was not informed about today's court sitting. After his complaint, the presiding Judge said that she will make sure that he recieve proper information when next court will sit on this case. Getting back to Hon Ifeanyi Ejiofor (Counsel to Mazi Kanu) he quickly narrated before the Court on how a motion for adjournment of the case was served him to which came as a shock knowing fully well how serious the case is, more especially when his clients have being in detention for too long without trial. Not withstanding, after series of arguments, the court upheld the motion for the adjournment. Mr Shaibu Labaran (Counsel to Nigerian government) prayed for short adjournment. However, in what look like a sorrowful narration, Counsel to Bright Chimezie discreetly raized an awareness to the court, praying that the court should be bold enough to compel Nigerian DSS to appear before the honourable court and answer the questions on why his client (Bright Chimezie) is still in their custody for the period of months now after a competent court of jurisdiction granted him an unconditional release. In reaction to the prayer, Justice Binta Nyako replied him by saying that she has nothing to do yet with Bright Chimezie's issue because she has not sit on the case. In respect to the deteriorating health condition of Benjamin Mmadubugwu, his Counsel, Bar Chukwuemeka Ejiofor on his prayers, prayed the court to consider the bail application tabled before the Court as it concerns his client as a matter of urgency. In response to that, Justice Binta Nyako angrily said that even without a proper ruling that she can never entertain any form of bail application any more from whosoever. She cemented her declaration by saying that he has right to appeal. Bar Ifeanyi Ejiofor shockingly asked "how can I appeal on the case that has not been ruled upon"? In more of dramatic adventure, Justice Binta Nyako said that she has the right to rule over herself or her stand on whether or not, any of them will be granted bail. Jumping to the whereabout of the leader of Indigenous People of Biafra (IPOB), Mazi Nnamdi Kanu, Justice Binta Nyako asked Bar Ifeanyi Ejiofor when he will be bringing his client before the court? Bar Ejiofor in his response, told the Judge that it is either Nigeria government or her Army will be the ones to decide when they will provide him before the court. Bar Ejiofor made it clear once again before the court that the whereabout of Mazi Nnamdi Kanu is still unknown since the Nigeria Army invasion of his residence in Umuahia. At this juncture, the case was adjourned to 20 or 21 or 22 of March 2018 for the commencement of trial.